Our camp-site is located 900 meters above sea level in a very quiet place with beautiful surroundings. There is a homely atmosphere, there are spacious and well-maintained pitches as well as neatly and clean sanitation. Moreover, the surrounding area is ideally situated for beautiful walks. 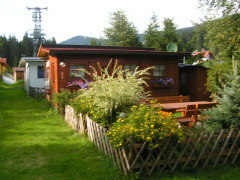 The camp-site is maintained with much dedication and there is a welcoming atmosphere. We offer romantic places (approx 100 sqm), spacious places for campers with a reinforced base and many green areas with water and electricity supplied for. 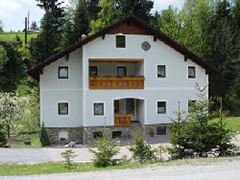 The site has a natural character and therefore blends with the landscape of Western Styria. In the store farm products are sold along with specialities from the mountain village and the surrounding area. In the adjacent recreational lake, the campers are able to spend time swimming, boating and fishing. Caught trout can then be cooked on the barbecue. In winter, when the lake is frozen solid, skating and ice hockey can be performed. Ice skating and ice hockey sticks are for rent at the reception. People with a fixed pitch are excited about being located near the city of Graz and the good infrastructure. During autumn there are lots of mushrooms, black currants and lingonberries to find in the woods. In the wild with your own family having breakfast or a barbecue – that’s the real camping feeling! The idyllic and beautifully situated mountain village with it’s Gothic church is really worth a visit. The guest houses in the mountain village have delicious Styrian dishes on the menu and pamper visitors with tasty seasonal specialties. Take a nice walk on the Hirschegger Alm or hike from hut to hut. 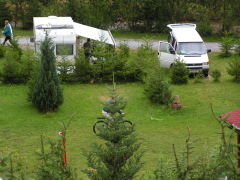 The campsite in Hirschegg bids you a warm welcome. Enjoy and relax in the beautiful hilly West Styria. flowing right next to our camp-site: a romantic, pristine mountain stream.